Home / The best Software Defined Storage and All-Flash Hyper-Converged Infrastructure platform for vSphere and XenServer just got better! Announcing Atlantis USX 3.0! VMware VVOL Support – Native without loading any additional VASA Providers! As a Software Defined Storage layer that overlays existing SAN, NAS or DAS storage, Atlantis has a unique ability to bring new storage features such as VAAI, VASA, and now VVOL to any underlying storage! This includes of course local storage devices like Intel flash and in the future 3D NAND, and of course Fusion-IO and other NVMe/PCIe attached flash. Atlantis has been officially added to the VMware HCL for their VVOL support, as you can see here. With USX 3.0 this functionality is provided out of the box and doesn’t require the vSphere administrators to load any additional VASA providers. Of course this means that the All-Flash Hyper-Converged Infrastructure platform HyperScale will be VVOL compliant once updated to ship with USX 3.0 and VMware vSphere 6.x. You can read more about HyperScale in my blog post here. Additionally, this means that Atlantis will be the first HCI provider on VMware’s HCL to support VVOLs in addition to a couple leading SAN/NAS vendors like HP 3PAR and NetApp. To learn more about VMware VVOL Support in USX 3.0, watch the video here. To learn more, Priyadarshi Prasad from Atlantis has written a blog post highlighting how this was accomplished in USX 3.0 you can find here. 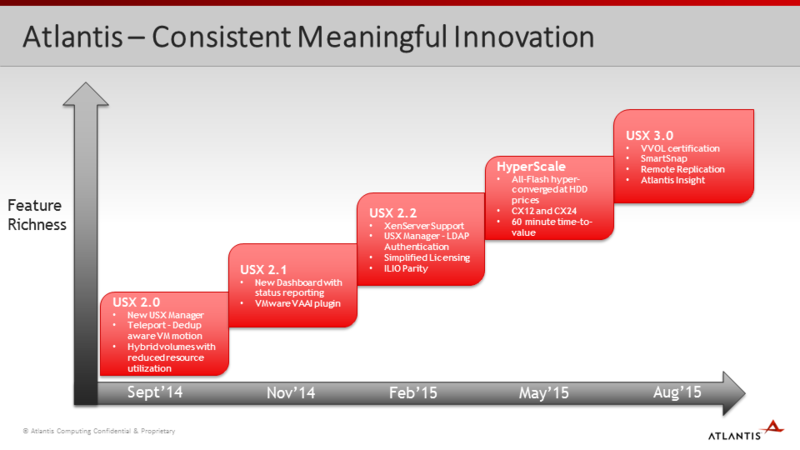 While in its infancy, USX 3.0 will have built-in volume level storage based replication. Initially this will support replication between any Atlantis USX or HyperScale deployment running USX 3.0 (or later). Will support long distance replication with a one-hour recovery point objective (RPO). Can be quickly and simply setup, similar to walking through VM Teleport workflow in the USX Manager user interface. Certainly this is a great start down the right path, and with Atlantis deduplication, it shows promise of a great future moving toward deduplication aware replication between sites. Testing of functionality to follow, but for now I’ll probably continue to advise customers to use VM based backup and replication solutions that sit above the storage layer (Veeam, Zerto, SRM w/vSphere Replication, etc.). Undoubtedly a really great start and I look forward to seeing what else lands on the roadmap for storage replication! As many hardware based storage vendors have found over the years, capturing anonymized telemetry data is key to understanding areas of improvement within the product. Atlantis Insight is a new service included with software renewals that will initially help when opening or triaging support related issues. This will include a couple key areas: proactive software updates, and alerts and logs sent to Atlantis for timely case resolution. Eventually this will be expanded to include: USX Deployment statistics and proactive analysis, failure detection and resolution. Pretty cool stuff! Can’t wait to see how it evolves. While the Atlantis USX platform continues to support VMware vSphere and Citrix XenServer, 3.0 brings along with it a couple cool new features that will benefit existing and new Atlantis customers! Over the coming weeks I expect I will be updating my lab to VMware vSphere 6.x and start doing some VVOL testing with the new features. I’m also interested to learn how well the new snapshot features integrate with VM level backup products, so stay tuned there as well. Really cool stuff continuing to come from Atlantis Computing with their high performance USX and HyperScale platforms. Stay tuned for more!